When it came to ending World War II, no move hastened the end of the hostilities more than D-Day, the invasion of Normandy by the Allies. However, D-Day was the end result of a complicated network of double-crosses that fed the Germans wrong information about where the invasion was to be launched. Normandy was relatively undefended because the Germans were expecting an invasion at Pas de Calais, France. 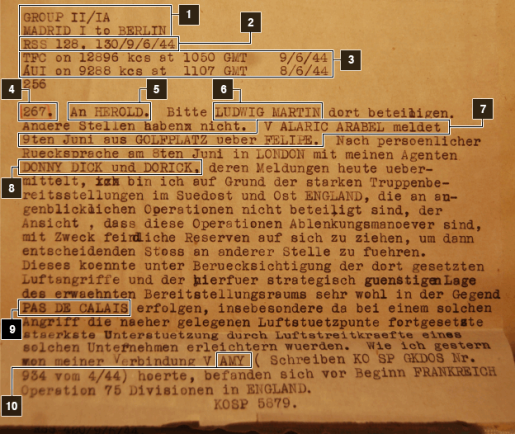 Recently discovered in a treasure-trove of documents being digitized was the very memo, intercepted by the British intelligence service at Bletchley Park, that indicated that the Nazis fell for the fake invasion. Here’s the memo that fooled Hitler and allowed the Allies to successfully invade Normandy. The agent who passed the memo onto Hitler, Juan Pujol Garcia AKA codename Garbo in Britain and Alaric Arabel in Germany, wasn’t exactly the image of the spy. “He was no James Bond – he was a balding, boring, unsmiling little man,” says Royal United Services Institute fellow Amyas Godfrey. “But he had the Germans completely fooled. They thought the information he was sending was so accurate.” In fact, Garcia had the Germans so fooled they even awarded him the Iron Cross, making Garcia one of the few men in history to get both the Iron Cross from Nazi Germany and the MBE in Great Britain!